Home / Shopping Deals / MYNTRA REFER & EARN OFFER | RS 100 FOR SIGN UP & RS 100 PER INVITE TO BOTH. MYNTRA REFER & EARN OFFER | RS 100 FOR SIGN UP & RS 100 PER INVITE TO BOTH. Myntra has started a very good program to increase its number of users by rolling out its refer and earn program. In this, you refer your friends to join Myntra App through a special link and Special Referral Code for every friend who successfully registers on Myntra App through your link and does shopping of Rs 100 or above, he gets Rs 100 as a reward and you will get Rs 100 too..
Myntra refer and earn program – Get Rs 100 per friends who signs up and shops on amazon through your invite. Friend also gets Rs 100 after his purchase of Rs 100 or more. 2 Where to get own referral link in myntra ? You will get Rs 100 instantly in your Myntra account for using above invitation code . Where to get own referral link in myntra ? 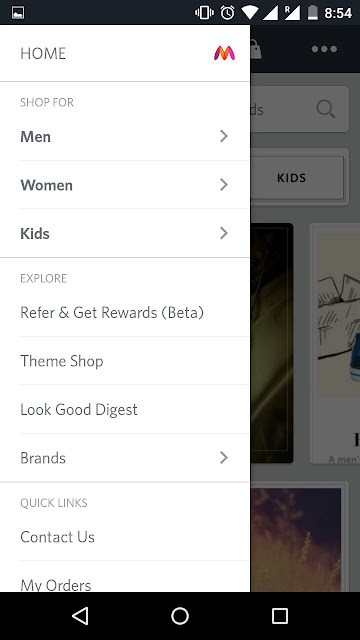 To get your own referral link in myntra app , Goto Left menu and select ” Refer & Get Rewards ( Beta ) . Copy your referrral link and share it with your friends . You will get Rs 100 on every successful referral after your friend makes his / her first purchase on From this camping you can earn upto Rs 2000 shopping gift voucher per myntra account . Windows – Available only on windows mobile os version 8.1 onwards. Also the email id/Mobile number through which your friend singup must not have been used for singup on myntra app earlier. 10 Computer tricks & hacks that are too awesome to be shared! Here’s how you may just be able to grab Xiaomi’s Re. 1 flash deals! Facebook Users Mistakenly Declared ‘Dead’ Including Mark Zuckerberg!